Following two earlier photography documentaries, BIFF offered a chance to explore photographic practice directly through a Q&A with the Swedish photographer JH Engström. For several weeks the National Media Museum had been showing an exhibition of photographs by Engström and his ‘mentor’ and later colleague and close friend Anders Petersen. 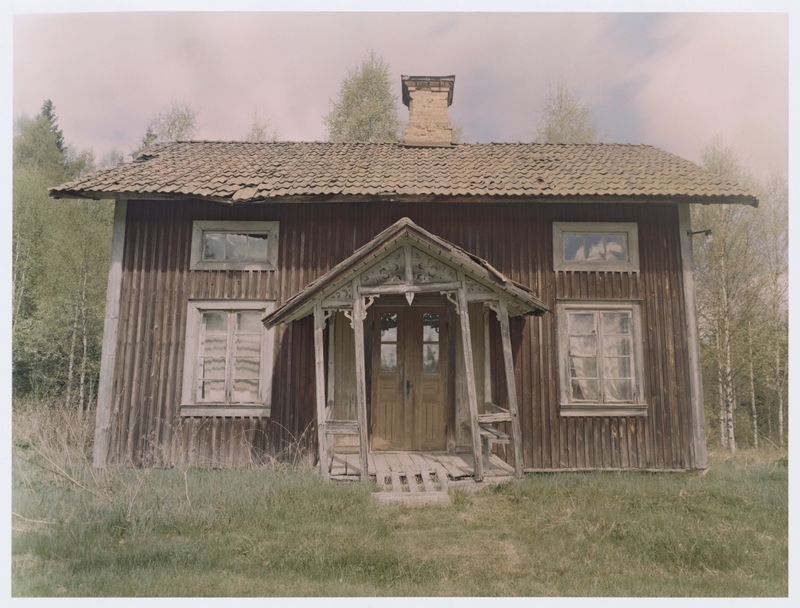 The exhibition closed a few days after this Q&A, but there is a book of photographs available for ‘From Back Home’ – a substantial project concerned with presenting images of the people and places of Värmland in West Central Sweden. In conjunction with the exhibition, I’ve been offering an evening class on aspects of Swedish Cinema entitled ‘Home and Memory’ so I was very interested to hear from Engström in person. 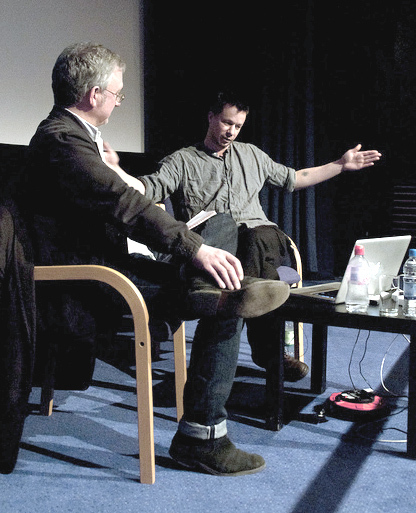 The event as advertised included both photographers and a screening of a short film about the pair’s work. 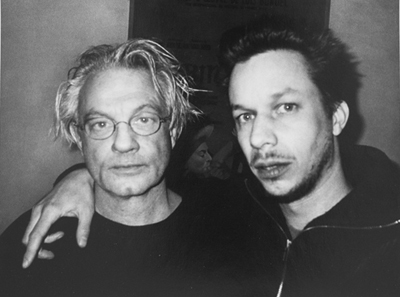 However, Anders Petersen was ill and unable to travel and so Engström showed his own film about Anders, A Film With and About Anders Petersen (Sweden 2006). He also showed a ‘rough cut’ of a slide presentation of photographs from his new project focusing on his own recent family life – an intimate portrait culminating in the birth of his child. I found the slide sequence to be filmic and very striking. The documentary on Petersen was also very engaging and took us into Petersen’s world of close contact with his subjects which enables his distinctive high contrast black and white portraits. I understand that Engström has trained as a documentary filmmaker and there was clear evidence of this in the way he presented his friend (who reminded me in some ways of the Swedish writer Henning Mankell). One of Engström's images in the 'From Back Home' exhibition. This image seems to me to be rich in cultural meanings and it 'speaks' to me about 'home' and 'memory'. The key word for Engström’s approach appears to be ‘intimacy’. There was discussion of what this might mean, but for me Engström demonstrates it very successfully in his work. He seems to have a loose and free approach – but of course he works very hard and very professionally to achieve his aims. He said that when he first worked for Marion Testino, he wasn’t interested in fashion but he was impressed by the professional approach that he saw. He works in both black and white and colour on different formats, but always analogue not digital. I gather from this that there is no rigid ‘technique’ to be applied. Rather, he goes with whatever feels right in capturing the feeling of intimacy. As he said – “photography is about everything except reality”. His first project was in fact concerned with ‘social documentary’ – creating images with members of a women’s shelter in Stockholm but his later work consciously moves towards less organised communities. In relation to the discussion about ‘close’ and ‘intimate’ qualities in the work a perceptive comment from the audience suggested the idea of the photographer who oscillates between the ‘personal’ – being immersed in the environment and emotionally close to the human subject – and the observer who is ‘close’ but detached. I think I’ve got this right but certainly Engström himself thought that this was an interesting line of enquiry. I was impressed by many of the ideas in this session. For instance, I was taken by aspects of Engström’s methodology. He said that in his projects, selecting and editing photographs for the book comes first and that this then informs what goes into the exhibition (and presumably how they are presented). The photographs themselves I found quite striking and in his new work I was interested in how willing he was to display both himself and his partner for the camera. He seems like a very confident and assured young man. When I first saw the ‘From Back Home’ exhibition, I was struck by how the characters in what were recognisably Swedish locales looked rather different from the stereotypes – or rather that they looked both distinctively Swedish and ‘not at all Swedish’ at the same time. This probably says more about my own lack of knowledge about Swedish culture. However, several of the students on our evening class on Swedish Cinema linked to the exhibition remarked on how at first the characters seemed unusual but that after we had watched films set in Värmland or adjacent counties they seemed very familiar. 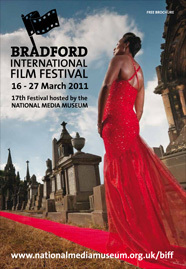 This entry was posted in Directors, Documentary, Festivals and Conferences, People, Swedish Cinema and tagged Bradford International Film Festival, photography. Bookmark the permalink.